In 2016, the New York Mets saw every one of their starters on the bench due to injury, and still finished with 87 wins. 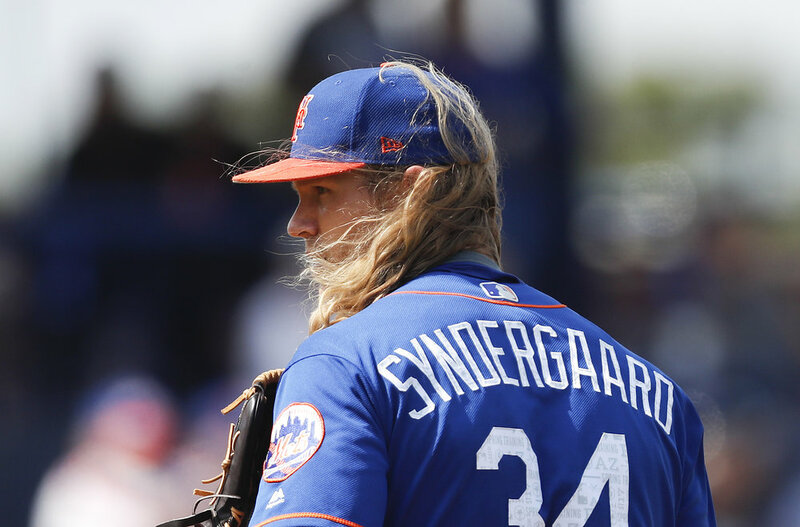 This season, with higher expectations and stiffer competition, resident Mets fans Stephanie Sheehan and Rachel Schaefer argue why the Mets will outperform their opponents and win the NL East. Rachel Schaefer: Call us biased, but the Mets look really good this year. This is a team that really didn’t make a lot of offseason moves. That being said, they didn’t need to. Last season, the Mets reached the wild card game despite the fact that Matt Harvey, Jacob deGrom, Steven Matz, Lucas Duda, Neil Walker, Asdrubal Cabrera, David Wright, Travis d’Arnaud and Yoenis Cespedes (to name a few) all saw time on the DL. After the loss of Bartolo Colon this offseason, it’s great to see Wheeler throwing live during Spring Training. He’s really been struggling to recover, but even if he doesn’t play at all this season, the late season performances of Seth Lugo and Rob Gsellman in 2016 were outstanding. They stepped up to fill roles no one could have expected them to succeed in, and they did. Even if this rotation fails to stay healthy, we know our pitching staff is deep. Stephanie Sheehan: I couldn’t agree more. Clearly, the team to beat is the Washington Nationals, who lost a big part of their offense in Wilson Ramos, an All-Star catcher who hit over .300 for the first time in his career in 2016. Matt Wieters is hardly a sufficient replacement, batting .243 last year. Other than that, the only big change to their roster is Adam Eaton, who is an above-average hitter, but has strange defensive numbers and has been in the AL for the last three years, a league with less impressive pitching. The Mets will undoubtedly be getting their rotation back to full strength, with a healthy Noah Syndergaard at the helm. DeGrom is consistently good, and even though the loss of Colon will sting, I don’t foresee Harvey being worse than he was last year, because he won’t be pitching hurt anymore. Matz is more seasoned. Wheeler is a bit of a wild card, sure, but like Rachel said, Lugo and Gsellman are more than capable of picking up the slack for one person this season, as opposed to the entire rotation last season. The team as a whole is much more solidified and less in flux, which bodes well when it comes to focusing on winning instead of who’s going to start at third base the next day. Schaefer: Plus, while the Nats have Max Scherzer, a Cy Young winner (and seemingly ungrateful one, at that), Strasburg is literally incapable of staying healthy. Trying to compensate for that last season went very poorly for Washington, who doesn’t have as strong a pitching staff. The lack of offseason moves for the Mets is really a good thing. This is a team that has already spent a lot of time together. Resigning Cespedes and Walker taking his option were the best moves management could have made. They also avoided arbitration with Rene Rivera, who has basically become Syndergaard’s personal catcher and, in my opinion, is better defensively than d’Arnaud (I’m sorry, but watching Travis try to throw out a runner stealing second has been one of the more painful aspects of being a Mets fan). And none of this has even gone into the strength of the bullpen! Giving Jerry Blevins a new contract gives us a solid lefty specialist. The combination of Addison Reed/Jeurys Familia at the back of the bullpen was solid last year. Particularly Reed, who has improved so much since his less-than-ideal numbers in Arizona. We did lose Verrett, but after last season, I don’t think any of us really care that much. Sheehan: I’ve said this a thousand times too, but there is literally no way the Mets can get more injured than they were last year. A team that saw pretty much every single player get hurt at some point, a team with James Loney starting at first base, a team that had Eric Campbell as the flagship third baseman before Jose Reyes saved us, a team with a rotation that had their arms falling off finished with 87 wins. 87 wins! Granted, the NL East is a division improved and the Mets had a ridiculously easy schedule to close out the season, but the Mets are also improving on the grounds that they have a real lineup again. The first five weeks are crucial, since every one of their games is against an NL East opponent until May 8, but Walker had a monster April last season, and it’s not impossible that it could happen again. The Mets blew some crucial games against the Nationals last season before the All-Star break, but with a solidified team that hopefully won’t be defined by injuries, they’ll put up an actual fight against the Nats again. Not only that, but the Mets have a surprising amount of depth to their team. I hate to cite spring training stats as legitimate, but... Brandon Nimmo is batting a major-league best .476 in nine games and the team has a major-league best .299 batting average. T.J. Rivera is batting .304, Lucas Duda is getting hits, Gavin Checchini is batting .500 in six games, Conforto is batting .409 in eight games and Travis Taijeron is batting .429 in nine games and will hopefully see time with the big league club this season. Basically, the outfield and infield talent are stacked and there are plenty of fallbacks if Jay Bruce and Curtis Granderson are awful again. I admit, a lot of the Mets’ success hinges on everything going right, but after a season where just about everything went wrong, the team is hungrier than ever to make the days where the young guns leading the Mets rotation count. Stephanie Sheehan is the associate managing editor for The Daily Campus, covering men’s basketball. She can be reached via email at stephanie.sheehan@uconn.edu. She tweets @steph_sheehan. Rachel Schaefer is a campus correspondent for The Daily Campus. She can be reached via email at rachel.schaefer@uconn.edu.